So Galentine's is a thing in the States, but not too sure about Japan. One thing I know that is gifting and receiving chocolates, to and from loved ones, is common here. Luckily, I got to spend the weekend with my wonderful girlfriends and made some chocolates for Valentine's, I mean Galentine's! I think it is more special to make something rather than buy pre-made chocolates. Also, the experience of making it together is wonderful as well! I love how Japan is so festive with every little holiday. It is so easy to make cute little goodies with materials available from your closest mall. 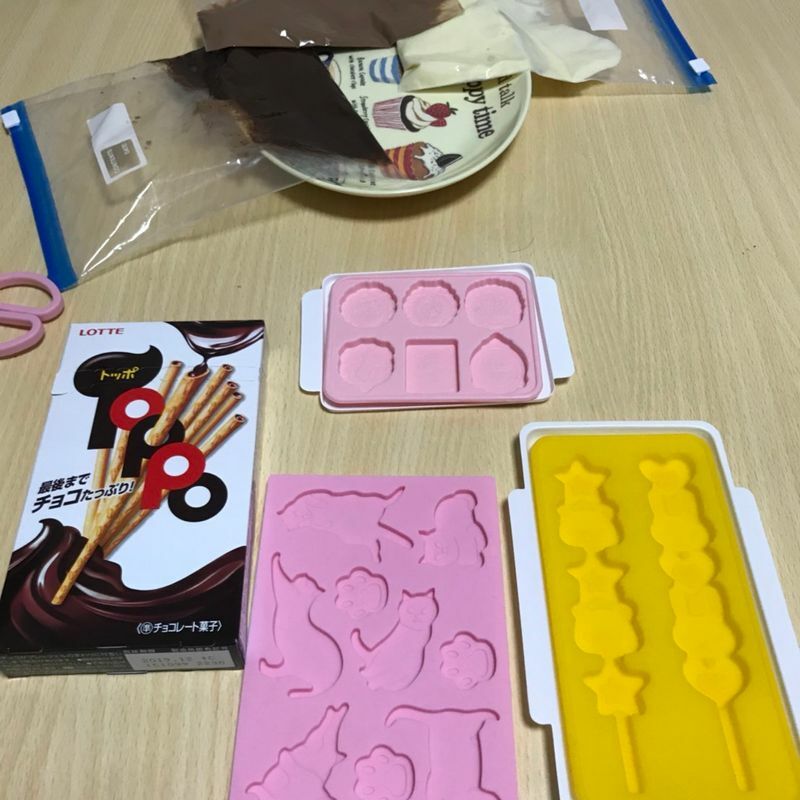 We purchased a few molds at the 100 yen store, Seria, and grabbed some Meiji chocolate bars from the grocery store. If you want a little extra, you could purchase all kinds of little candy decorations such as rainbow colored sprinkles and pre-made cookies that you can fill with chocolate or something else like jelly. You could go also go above and beyond by buying super-cute packaging from the 100 yen store. Japan is known for its beautiful packaging so you should definitely take advantage! 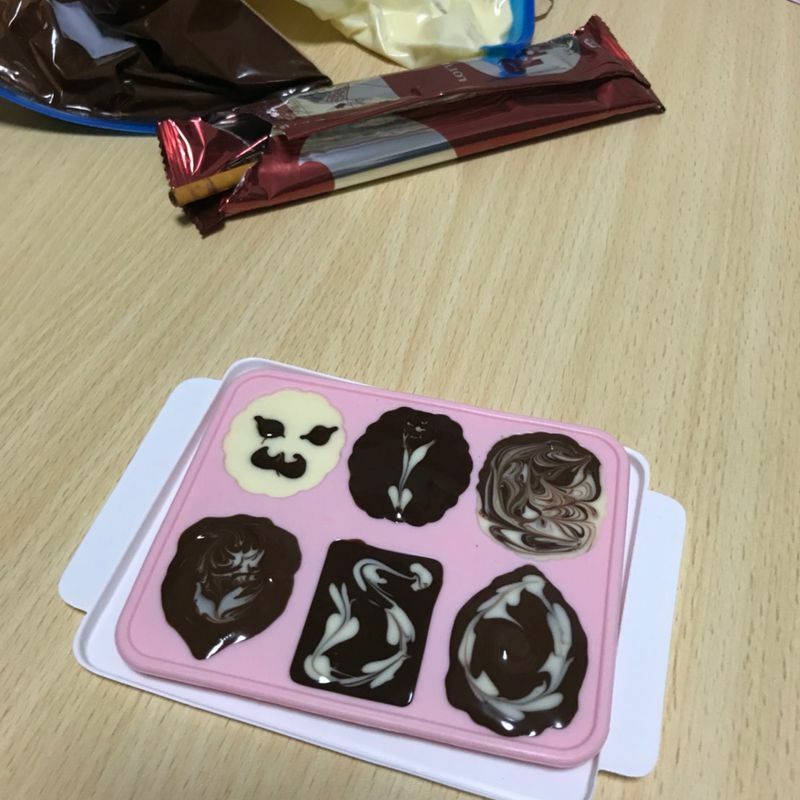 Funny story, but instead of melting chocolate in a microwave or in boiling water, we melted the chocolate under the kotatsu! Haha! It was very efficient since we were already using the kotatsu (saving electricity/gas as well). We broke the chocolate bars and put them into a freezer plastic bag to heat up under the kotatsu. The smaller the pieces were broken into, the easier to melt. We bought dark chocolate, milk chocolate, some roasted nuts chocolate, and white chocolate! 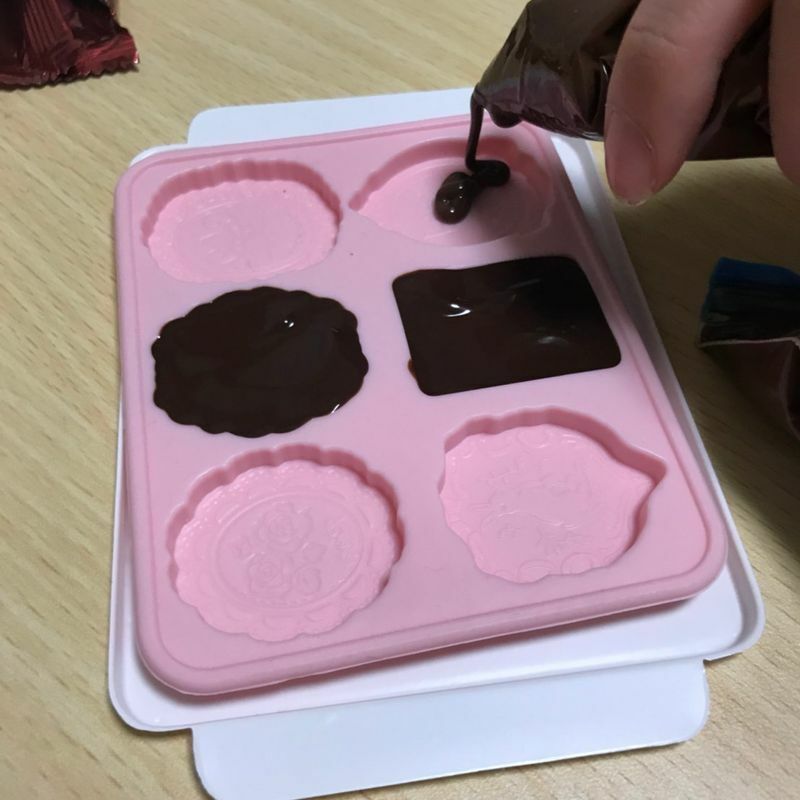 We cut a hole at the bottom and started to squeeze the chocolate out into the different molds. 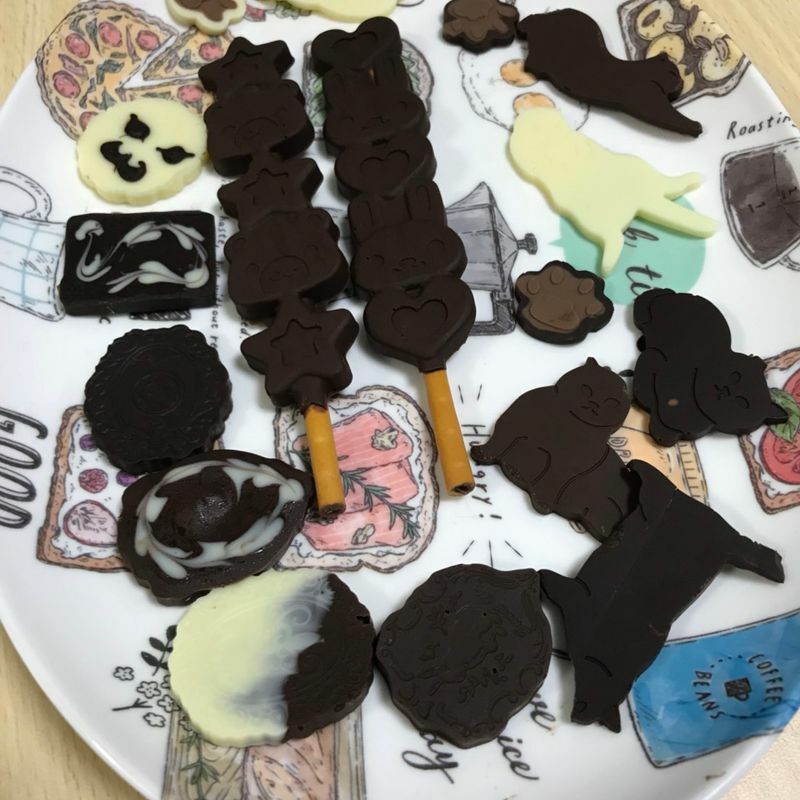 We tried to be creative by doing some "latte art" on our chocolates, but it came out very messy. Haha! It was all good fun. 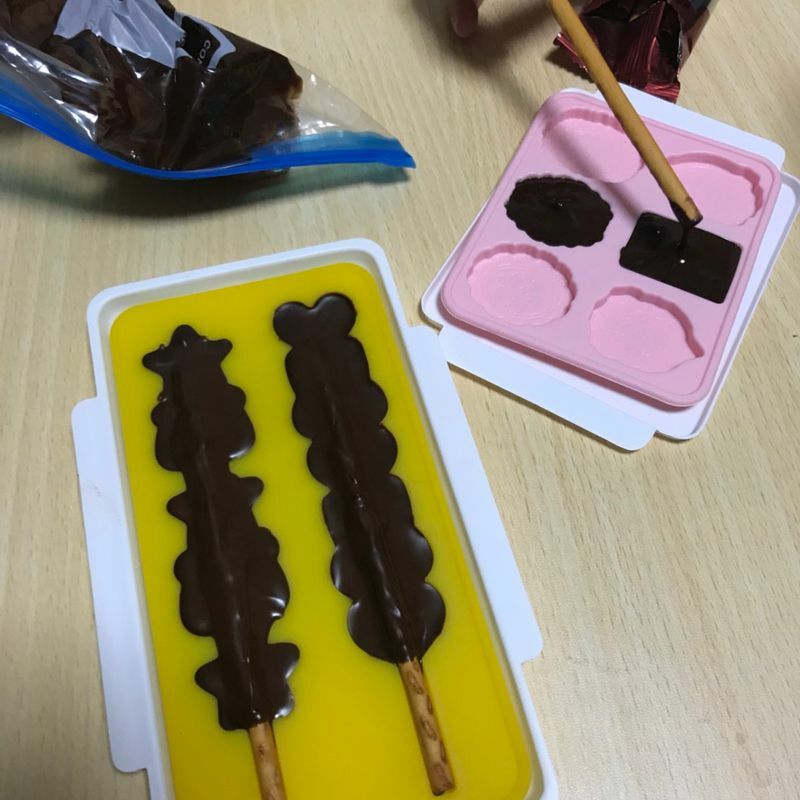 We also bought Toppo sticks for this mold specifically. Pocky work as well! After putting the chocolate molds into the freezer for the recommended 30 mins, they were ready to pop out! I think the chocolate sticks came out the best! 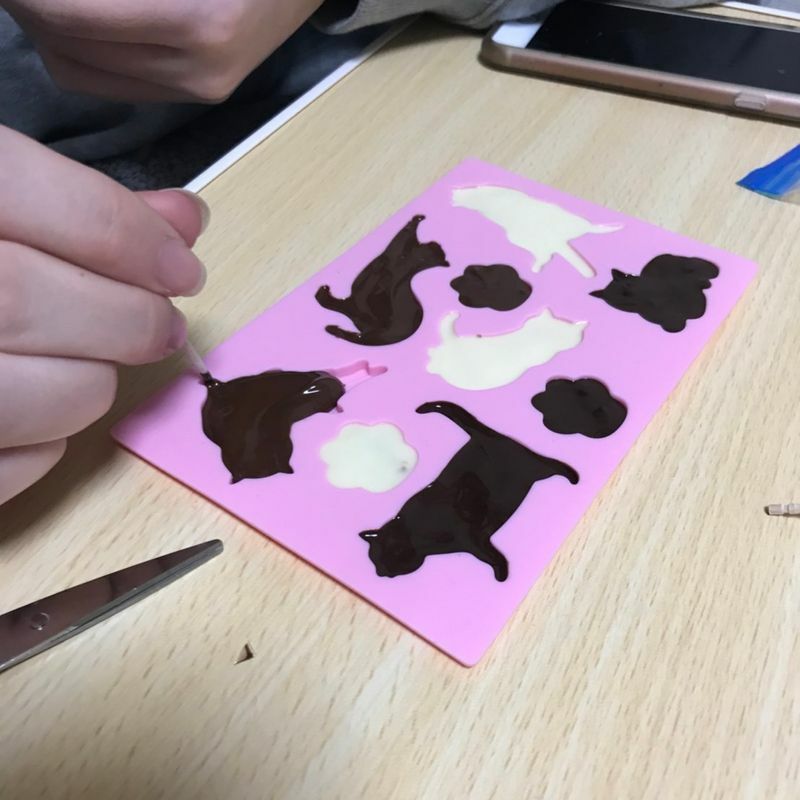 The cat mold was a little delicate so as the chocolates were popped out, you can see that some are missing ears, tails, and even a head! This was a very simple and fun gift idea for friends, family, or anyone! You can be creative or just simple as ours, and the chocolates will look and taste great! Oh, I didn't know you can put the toppo ones in that form! I'm excited to try that out, too!